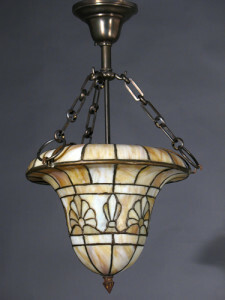 There were many Antique Leaded Glass manufacturers. There were a small number of companies like Tiffany and Handel where the form became important early on when catalogs could still be found and the expense taken to reprint and sell them. Or even someones interest like Dennis Peter Myers who wrote a National Park Survey called “Gas Lighting in America” in the 1970s. 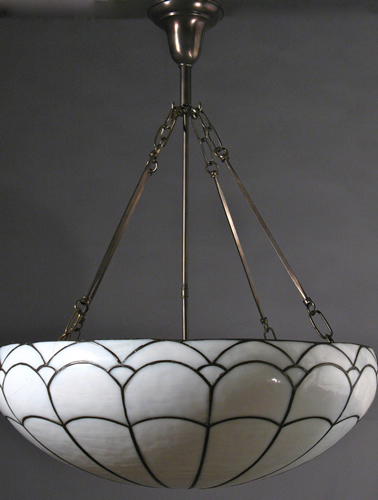 There are other books and reprints but compared to the Sea of Antique lighting fixtures to be found there is really very little information about the manufacturers of most fixtures. 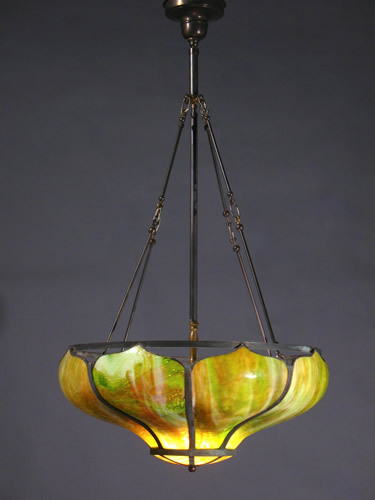 One of the difficulties with finding the manufacturers of Leaded glass lighting is that it was often made in small workshops as more of an art form or “craft form” by individuals just interested in creating something. This is still done today and it is a quite popular pursuit in this country. Another difficulty in finding the manufacturers, was that these leaded glass lighting fixtures were signed by the manufacturers almost never. I have often wondered about this because I get many emails every day and am asked this question. Many of the fixtures were sold by distributers during the period. 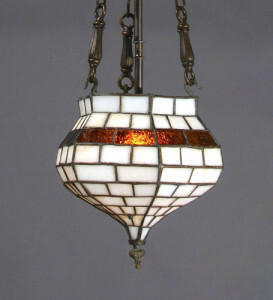 I have an old Catalog by the Western Gas Fixture Company. 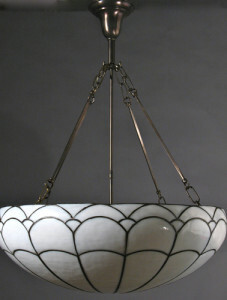 I know they did not sign their fixtures and it seems obvious from the Catalog that the myriad of light fixtures they are selling came from many different suppliers. They operated around 1915. 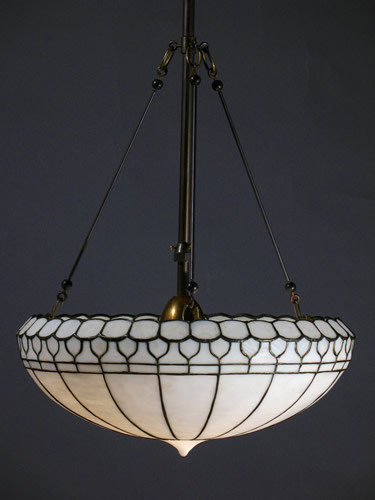 For us, 100 years later, these Leaded Glass Inverted Dome lights hold an aesthetic value that did not seem to be recognized, maybe because these fixtures were more commonplace. In fact the lighting fixtures that were signed, like E.F. Caldwell, who was very prolific around New York City, go for a premium compared to unsigned fixtures of the same quality. And that is another thing. A company like Caldwell where many examples can be found is more likely to have a legacy. I just think a lot of these Antique leaded glass lighting fixtures were not considered important enough in the period. 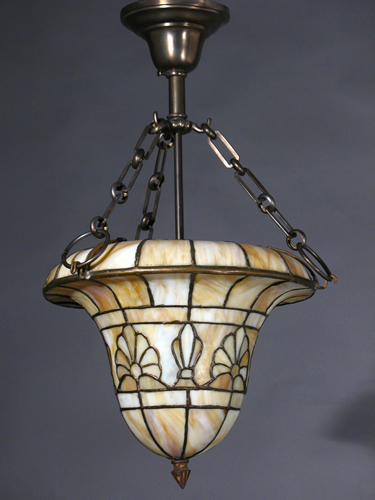 We sell a lot of Leaded Glass Lighting and have become very aware of its lasting effect as an aesthetic/artistic quality appreciated by our customers. Very often individuals hand can be seen in the manufacture. 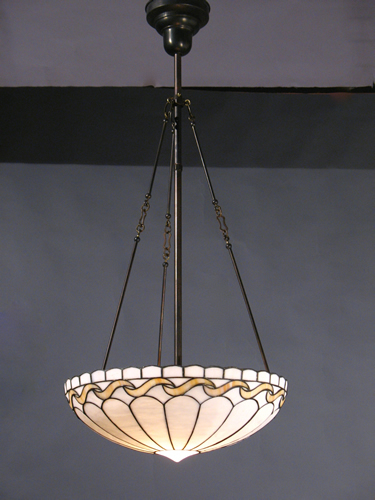 There were companies like Miller Lamp Co., Pittsburg Lamp, where a convenient place to put a manufactures stamp is on the lamp base. 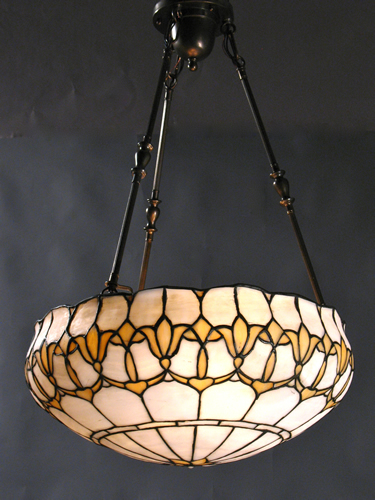 When it comes to Leaded Glass more table lamps were sold than any other form. When it comes to Leaded Glass Light fixtures, this is not as common. 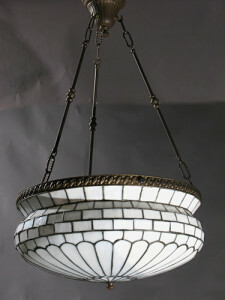 Circa 1905, Leaded Glass inverted Dome with 72 Leaded glass panels & wonderful geometric and arch design.